Tirupati hill is where Lord Sri Venkateswara’s temple and the plains where Goddess Alamelu’s temple are present. 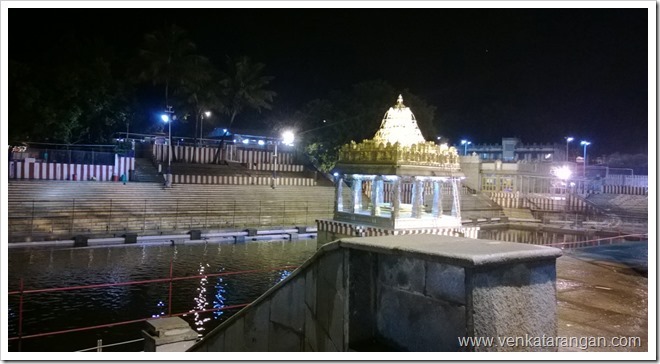 Its one of the most sacred places of worship in South India for the Hindus. The temples are believed to have over twelve centuries of history. 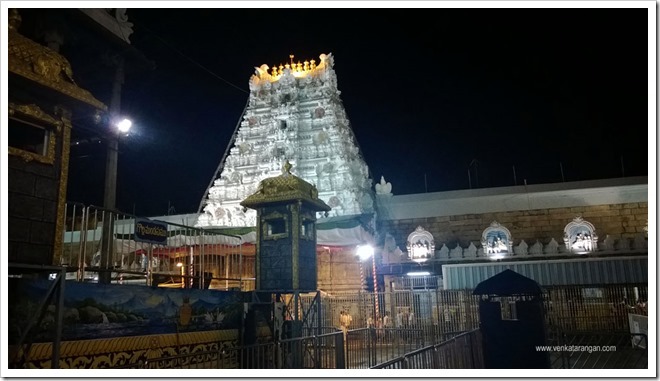 I go there say yearly once (no fixed schedule or calendar followed by our family for the visits) to offer our prayers to the Lord Balaji (aka Lord Sri Venkateswara). Tirupati town is about 160 Kilometers from Chennai where I live, it takes about 3.5 to 4 hours to reach depending on the Chennai city traffic to get out of the city area. There is no order in which you need to offer the prayers to the God and Goddess, unlike other Hindu temples they reside here in separate places. 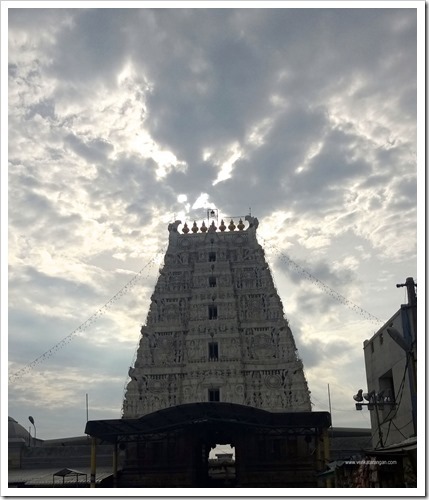 Goddess Alamelu is worshipped in the Tirupati town (the plains below) and Lord Balaji on the hilltop. 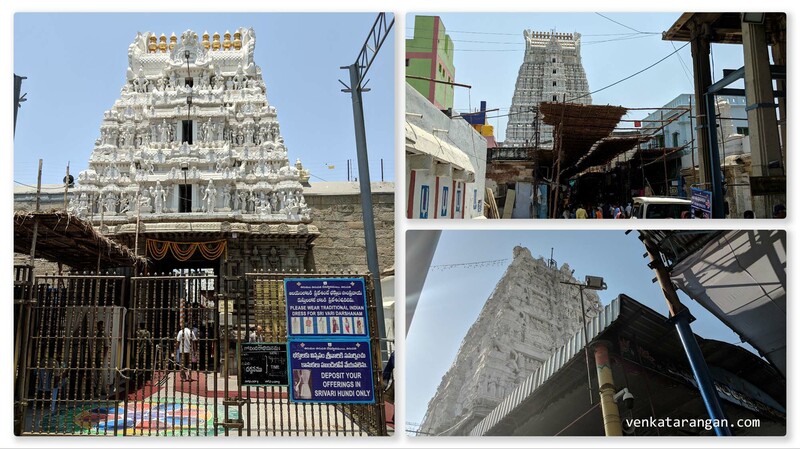 My Grandfather Sri Krishnaswamy Sarma (LIFCO Sarmaji) used to advise us to visit the Goddess first, carry her blessings then go up the hilltop to see Lord Venkateswara. This he said protects you in the journey up the hill and down, and the Goddess is a mother-figure for every living being more sympathetic to our prayers and will put a good word to Lord on our behalf. A clever man my grandfather indeed! There are 7 hills here, they are called Thirumalai in Tamil language, Thiru means Holy or Sacred and Malai means Hill. The hills are revered as sacred and abode of the Lord himself. The temples in the area, the hills and the environment around it are protected through an act of Andhra Pradesh state assembly by a trust called Tirumala Tirupati Devasthanams (TTD). 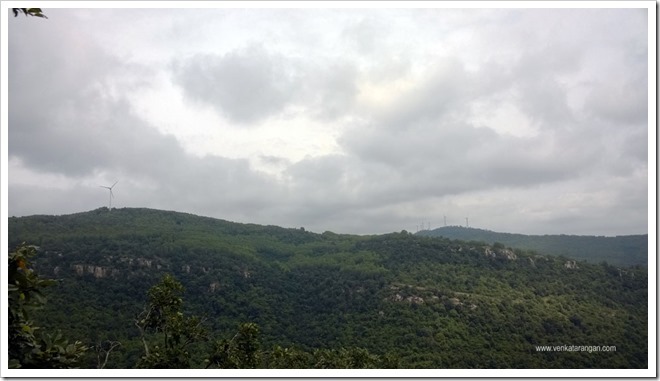 Unlike many other parts of India, these hills are well kept as TTD is well funded through the donation/contribution at the temple by the devotees. The journey up the hill from the plains is about 15-20 Kilometers with few tens of hairpin bends. During my school days (say till two decades back) there used to be only one route for both directions of traffic and with cars of those days (Ambassadors) it was not an easy journey. Nowadays there is separate route uphill and downhill, the roads are well built, wide and safe. 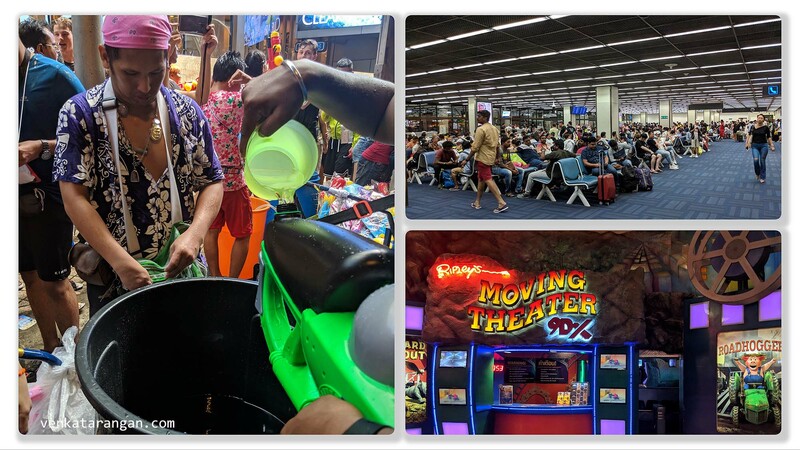 There are regular breakdown service vehicles plying both the routes, security and bag scan before the gates uphill, restrooms along the way. The journey uphill takes about 30-40 minutes and downhill is only 25-30 minutes though its a longer route. 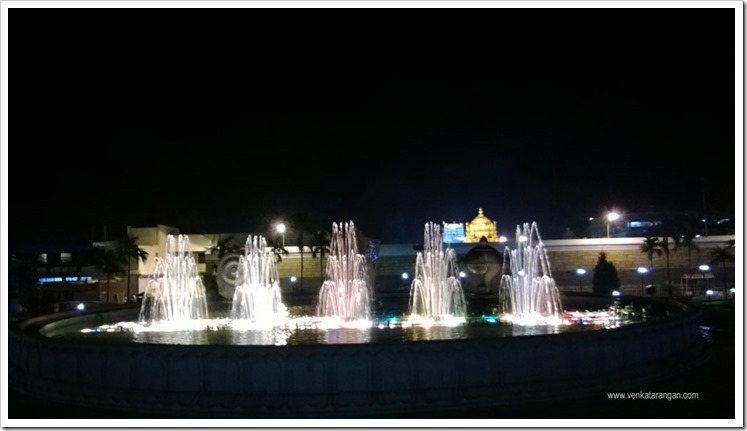 Apart from your private cars, you can ride on the free bus service from the plains (Tirupati town) to hilltop (Tirumala). Many thousands of devotees go up the hill by foot as an offering to the God. Walking up takes about 3-4 hours depending on how fast you walk, there are shops along the way selling you cold drinks, peanuts and water. I have down the walk uphill few times many years back and my favourite drink is the Lime salt soda they sell in the shops along the way. 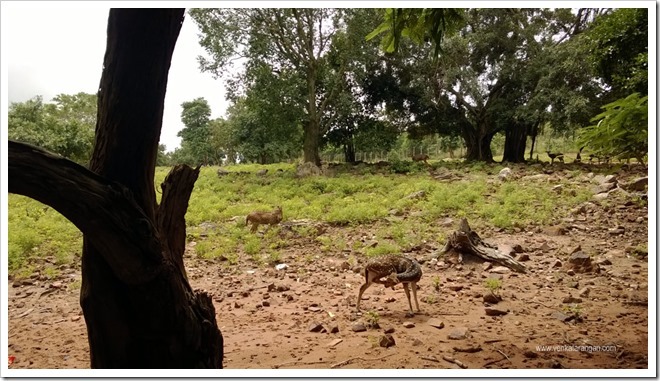 The TTD trust maintains lots of parks, animal sanctuaries and smaller temples along the routes throughout the hills. 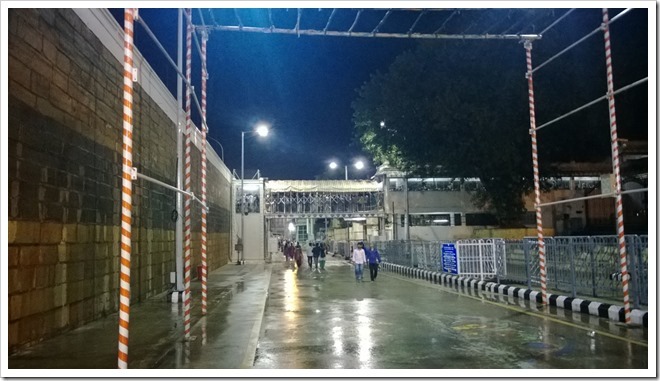 The temple in Tirumala gets about 75000 to 100000 devotees every day, its open almost 20 hours a day. You need to get in designated Queues, the free Queue can take anywhere between few hours to a whole day before you reach near the Sanctum Sanctorum. When you reach there you get a glimpse of the deity for few seconds only, you can’t stand there beyond that as the temple volunteers will push you out. They need to do this as you can understand, the queue behind you will be of thousands of people waiting for hours just like you. For all this, the lines are well managed, secure (cameras everywhere) and orderly, which are rare in Indian temples. Around the four Mada streets around the main temple, there are numerous smaller temples to other Hindu deities. 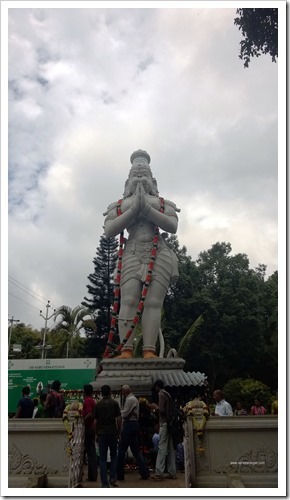 This post will be incomplete if I don’t mention about three main activities that Tirumala is famous. Laddu distribution. Laddu is a popular sweet in India (ball-shaped) and no other Laddu is famous as Tirupati Laddu. 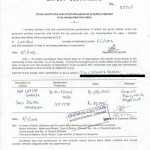 It was granted a Geographical Indicator (GI) tag in September 2009. Laddus are handed over to all devotees free (you can buy more if you wish in designated counters for the same) as Prasadam. Your friends and family around you always ask for pieces of the Laddu after they know you went to Tirupati. As per this article in a Newspaper, the tradition of Tirupati laddu is nearly 300 years old and on an average 1.5 lakh laddus are either sold or distributed to devotees daily. About one tonne of besan flour, 10 tonnes of sugar, 700 kg of cashew nuts, 150 kg of cardamom, 300 to 500 litres of ghee, 500 kg of sugar candy and 540 kg of raisins are used daily. 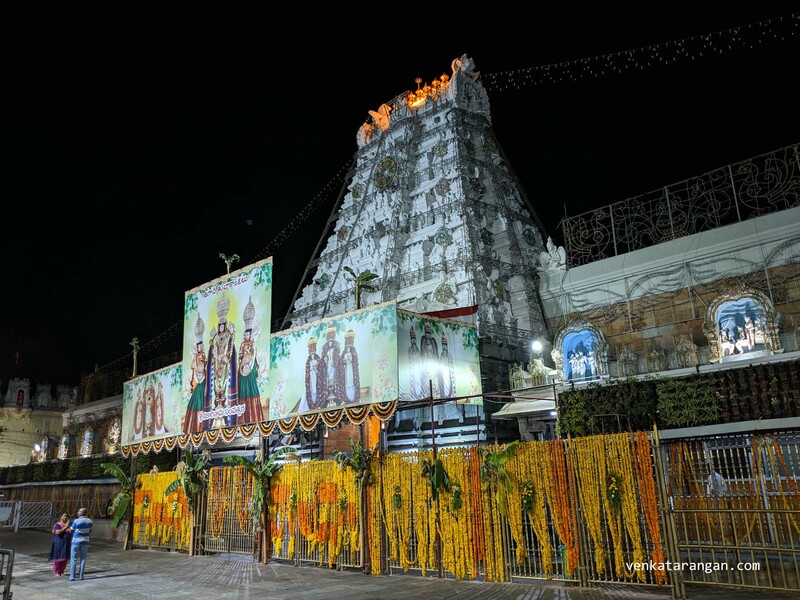 Hundi (Donations): Millions of devotees donate every year huge sums of money, gold and other assets to Lord Sri Venkateswara temple in Tirupati. Every day the temple receives donations through Hundi (kind of Donation pot, here it is made of cotton cloth like a big tent with a hole on top for offerings) and financial instruments over Rs.2 to 4 Crores (USD 500000 to USD 800000). 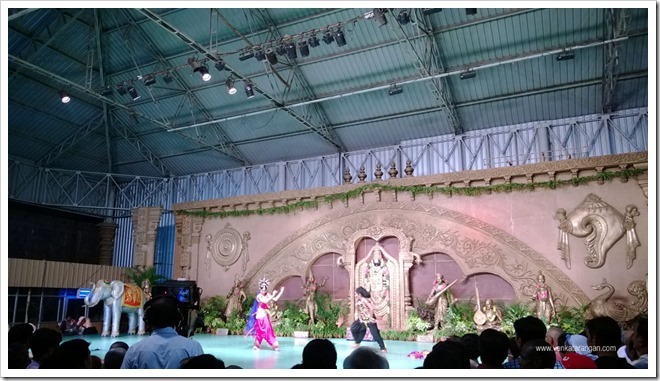 These are used for various religious and social welfare schemes by the TTD trust. 3. Hair tonsuring: Apart from money and gold, Devotees also offer their Hair through tonsuring as an offering to the Lord. There is a mythological story for this tradition. Footnote: My parents named me Venkatarangan, the first part “Venkat” is named in reverence to the Lord Sri Venkateswara residing here; the second part “Ranga” is for remembering Lord Sri Ranganathaswamy in Srirangam.